Take a minute to think about how many plastic bags or papers you have used over the years? That might be just what you think need to realize why it’s important to figure it out a way to change and preserve the earth. Don’t look down on any little change because ‘Every little change you make has the potential to make a huge different’. Jumix is here to share some of the ways in which you can do whatever you love but in a greener way. ‘Turn the lights off, when it is not in use.’ sounds familiar? It is one of the fundamental habits we try to practice every day in the office. No matter in the office or home, power saving should always be kept on the corner of your mind. However, how is it possible to work in the dark? It is inevitable to turn on the lights for more than 8 to 9 hours a day. Therefore, LED lights are being installed to save at least 75% of energy rather than utilizing standard incandescent light bulbs that delivers the same light output. Win-win situation achieved! On the other hand, it will be highly beneficial to use light wall colours. As light paint colours and higher gloss sheens reflect daylight, meaning your space will need less overhead lighting. Each colour has an effect on the mind, the body, the soul, and a balance between the three. For example, red represent physical which getting your heart pumping and raise your pulse. Blue represent intellectual which will helping calm the mind and aid concentration. While yellow represent emotional and green represent the colour of balance between the three. 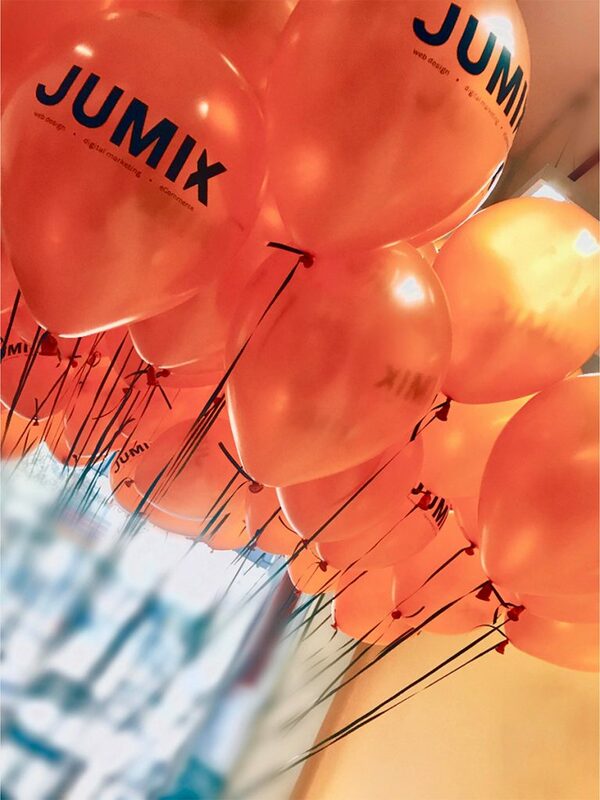 In Jumix, we have chosen to paint the colour orange on our featured wall right after the entrance. As it is our theme color and it symbolizes energy combined with fun, a risk-taker, and signifying our outgoing business culture and brand. Now, you get the idea of how to use colour psychology to give your surrounding a greener approach! Before there was air conditioning, human beings lived differently. During the summer or during hot times of the day, they would change their habits such as sitting under trees or shady area or simply have cool beverages to cool down. Nowadays with the advent of air conditioning, we are now able to live in a refreshing environment. Most offices are air conditioned, in some places however, rely on air conditioning 24 hours a day, seven days a week. The more often air conditioning is being operated, the more contribution it gives to global warming. It will act as a never-ending cycle that can never improve for the better. The greenest weather is about Heating and Cooling. Are you ready to know more? While the weather change throughout the year, we can wear cooler clothes made from lighter materials such as organic cotton that is more permeable and comfortable to wear on sweltering hot days. On the other hand, heating and cooling controls are often a contentious point in an organisation. Some people are always too cold whilst other are always too hot. So, it is advised to set the temperature to the ideal for the utmost comfort indoors. A research from OHS Reps suggests the acceptable ranges of temperature and relative humidity for offices is 24.5 – 28 °C with 30% humidity while 23 – 25.5 °C with 60%. Setting the temperature around 23-25 degree Celsius is helpful for reducing electricity bill and stay comfortable at indoors. This is also helpful for reducing the production of carbon dioxide in our earth as well. Can you do it with working in an environment just in 23-25 degree Celsius? Yes, Jumix did it! We have set the point between 2 to 3°C apart so that the air conditioner does not cycle frequently. According to a research in 2015, global paper consumption has reached 398 million tons per year, which worked out to 12,620 kg per second! Also in 2015, global demand for paper and cardboard increased by an average of 2.2%. While graphic paper and packing paper represent approximately 88% of consumption. The greenest paper is no paper at all. But how? The easiest way is to keep things digital whenever possible. Nowadays, in the era of technology advancement, we could do a lot with the Internet. It’s easy as keeping all the things digital or in a digital way. For example, keep digital files on your computer or mobile devices instead of using file cabinets. On the other hand, you may transform traditional marketing strategies to digital marketing as well. For example, advertise your business through different social network instead of distributing catalogs or brochure. Other ways to go paperless include printing less in general, you may ask your vendors to provide e-statements and invoices instead of paper statements. Setting up automated payments further reduces paperwork by eliminating the need for printed checks. By using existing technologies to remove some of the paperwork burden of our earth, companies will find that they’ve both reduced their printing cost and it will improve the efficiency of their business as well. We deliver high quality Web Design services, Facebook and Google advertisement campaigns. Thus, we encourage businesses to cut down its office paper use and fully transform to digital ways to help reduce the greenhouse gas emissions for a better and greener environment! If it’s possible bring in a desk plant to improve indoor air quality and bring in some nature into your office environment. Numerous scientific have proven the positives of having more greenery in your workspace. While humans need oxygen to survive, plants absorb gas we don’t need which is carbon dioxide and combine it with water and light to produce energy in a process. However, place a desk plant in office will help to improve the air quality. Besides, it helps you to feel more energetic when you can get a fresh air every morning. Through a study of University of Technology, Sydney, found significant reductions in stress among workers when plants were introduced to their work space. Nowadays, many people are subconsciously living in anxiety of their work even during weekends when they are still constantly getting back to emails or preparing themselves for work in their new week ahead. However, a small little desk plant will help them to reduce stress and anxiety. Besides that, a small little plant has a big power of improving memory retention and help you to score higher on another basic task. As you know, just one plant per work space can provide a very large lift to staff spirits, and so promote well being and performance. Dr Chris Knight from Exeter University concluded that employees were 15% more productive when workplaces are filled with just a few houseplants. While in Jumix, every employee has a part time job of being a gardener. Majority of us will have a small plant on their desk, some even name their plants and here is ‘PAZ’! 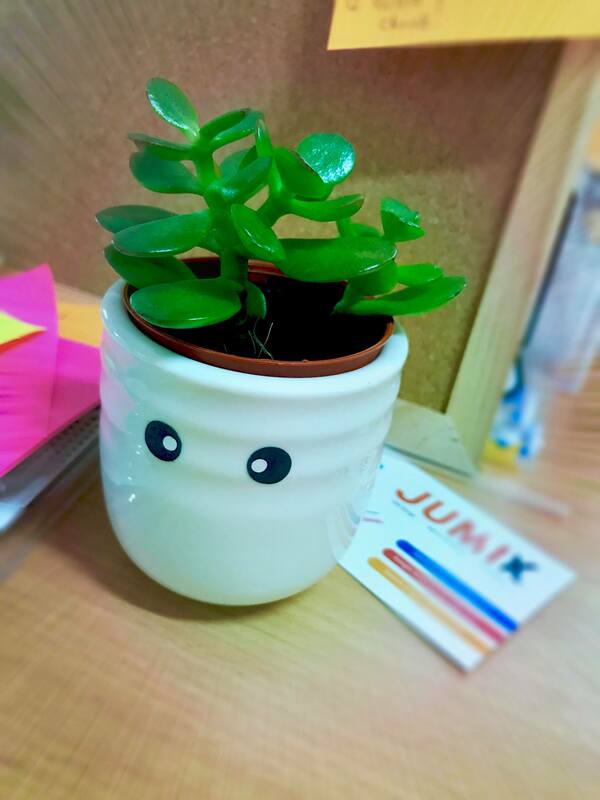 Greener Ideas for Office, Start from Jumix! 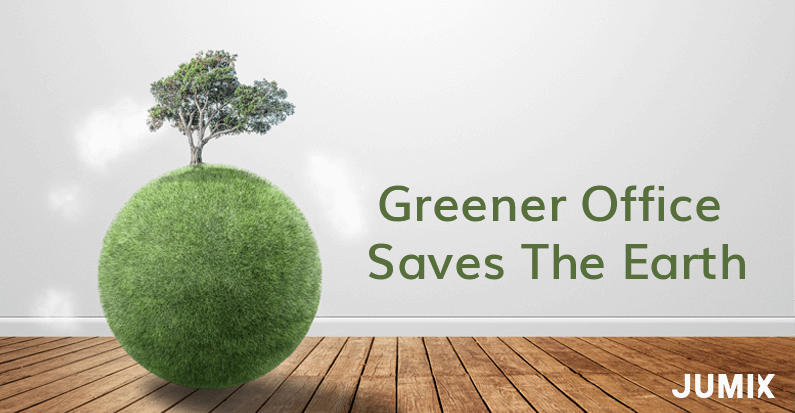 Greener Office Saves the Earth, just do it Today!